Price: $125.00 - FREE TO MEMBERS! Primavera's substantial documentation is not geared towards the experienced P3 or SureTrak user. It is directed more towards new users and those planning an enterprise implementation. While there is good reference material in the Primavera manual, its presentation is simply too broad and will only get in the way of the construction scheduler who simply wants to get up and running on P6. 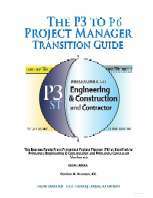 This Transition Guide is intended to help you quickly become comfortable with using Project Manager, with the confidence that you are going to obtain the results you need with the least disturbance to your schedule efforts. Gordon Aronson has produced countless construction schedules; he knows your needs and he knows how you think. As an early user of P6 and its predecessors and as a certified trainer, Mr. Aronson is uniquely qualified to write this guide book, which provides a straightforward and practical approach to get you up and running. With over 150 full-color screen shots and illustrations, the P3-to-P6 Transition Guide will have you comfortably deploying P6 schedules without missing a beat. It would take two-day basic and advanced training classes to cover the same ground in this superb Guide.